The pictures are coming in!! Thanks to all that built figs and helped with the shoot! The time has come, once again, to post the sign-ups for the Sigfig Photoshoot for BrickCon 2013. 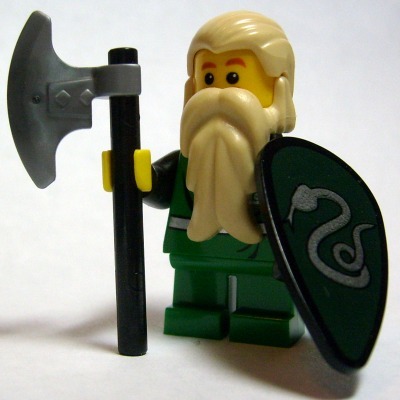 For newcomers to the community, your sigifig is your plastic representation of yourself. 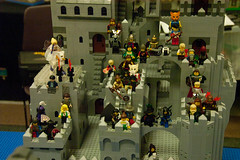 This does not have to be castle-y for our purposes; not everyone has a castle oriented sigfig. While preferred, it's certainly not required. FOR ATTENDEES: Please be sure to bring your sigfig with you! The photo will be take Saturday night sometime, after public hours. FOR NON ATTENDEES: You have a choice! You can either A) Post in this thread and someone may volunteer to make and bring it, or B) if you have a custom fig, you can send it to me and I'll be sure it gets returned to you. It's a clear photo, and it's easy to reference the torso, face, hair, and legs. If you don't have a photo and aren't able to take one, please browse either Peeron or Bricklink and give us the references. This makes it easier on us, the attendees, to construct your figs. 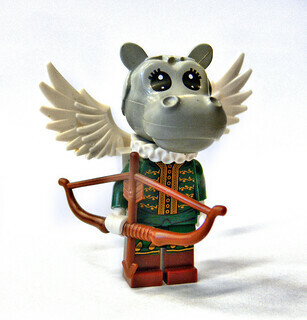 If you have a particularly rare piece for any of it, please also consider alternatives: If your sigfig uses the forestwoman torso, for example, or the white ninja, please give us a cheaper, easier-to-find alternative. With the massive collections between the attendees, we should be able to construct your fig, but we'd like a back-up plan. For Option B: Please send me a PM, and I will let you know what snail-mail address to send your fig to. If at all possible, Option A would be best, because it has less room for the USPS to err and lose your fig. But if you really want YOUR fig to be there, we'll do what we can. Just shoot me a PM. At the Con itself I will try to get the picture done late Saturday after public hours. So you have plenty of time to find me. It case we haven't met in person, ask around at the castle table and they will know me. Also, my badge will say, "Give me your CC sigfig" for your convenience. I will try and update this thread as you post your need to be built figs and volunteers come forward to build it. Last edited by BiggerJim on Tue Oct 08, 2013 7:47 pm, edited 22 times in total. Rayth Wulfsbayne will be in attendance! I can also help build non-attendee figs again this year. I will not be there, but would be honored if my sig fig could be included. He is made up of brown Jedi hood, yellow Dumbledore head, any brown torso, brown legs, two brown capes and a black rubber band. *EDIT* the torso has white hands! (instead of yellow). Last edited by Griffon on Tue Jul 23, 2013 8:37 am, edited 1 time in total. 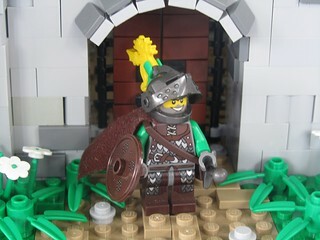 Here is my SigFig, everything he has can be seen pretty well. 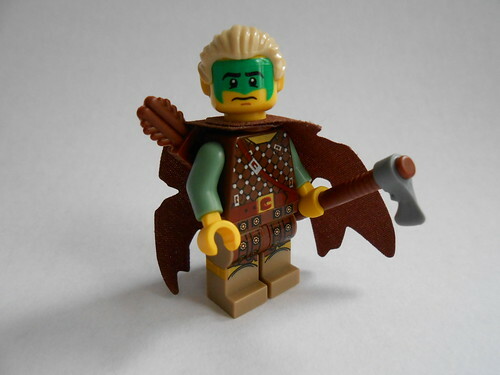 I think it'd be really great to have my Elf recreated to visit BrickCon! Thanks! Bruce N H wrote: I will not be there, but would be honored if my sig fig could be included. He is made up of brown Jedi hood, yellow Dumbledore head, any brown torso, brown legs, two brown capes and a black rubber band. Bruce, I have your sigfig permanently built on a shelf in my LEGO room. He'll be there. Sir Marius wishes to attend as well. Any LoTR or classic sword will do. Thank you, Jim, for taking this on. I will be bringing my sigfig with me. 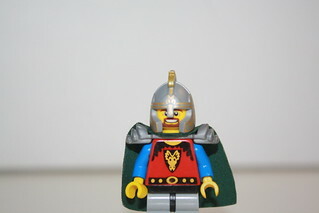 My sigfig hopes to return to the gathering, this time with a fancy new hat and robes. 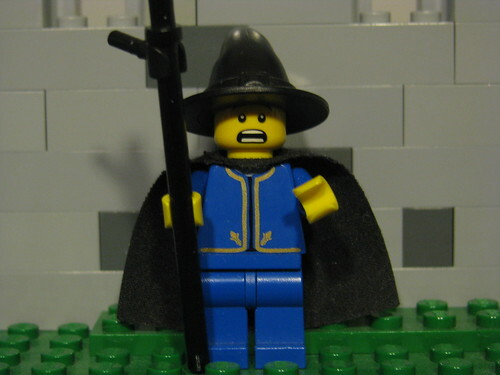 Black hat, black cape, blue pants, Bespin guard torso (can be replaced with a plain blue torso if need be), and a scared face from the Atlantis line (can be replaced with any scared face, the CM Hazmat suit's face seems to function well). The staff is not at all necessary. From the looks of it, I ought to have no problem building this guy. Those are normal green arms, I assume? The picture kind of looks like light green. I can build and bring him. Parts list: Torso is this with black arms, head is this, hairpiece is this in tan, and the green stubbies can be replaced with black if necessary. Thanks a bunch to whoever ends up building him!